Weak from close up, but sparkles from far away. 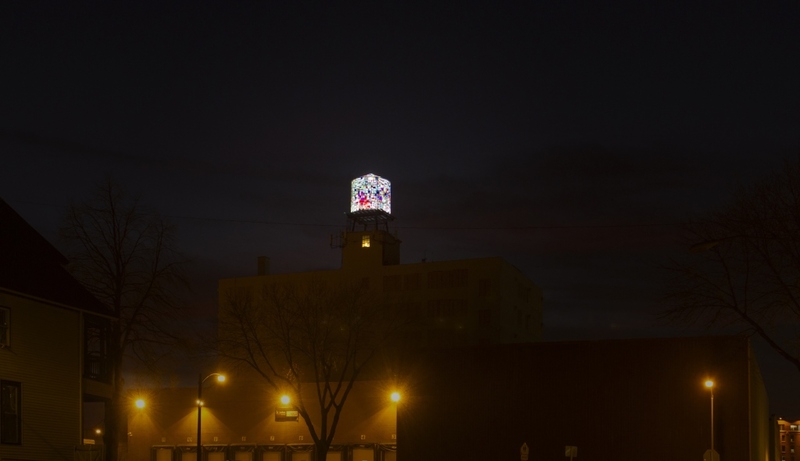 This public art is suppose to remind us of the water towers that once topped off robust factory buildings in Milwaukee. Except its pattern of shapes is nebulous and the pastel palette is wussy. More evocative of domestic decor than early 20th Century industrial design. Remember when pop and psychedelic design lost their mojo, the dead zone between the Rolling Stones and Patti Smith? This muted suburban motif from the 1970s was infinitely adaptable. Found its way onto everything and came in different colors. A plastic shower curtain perhaps? 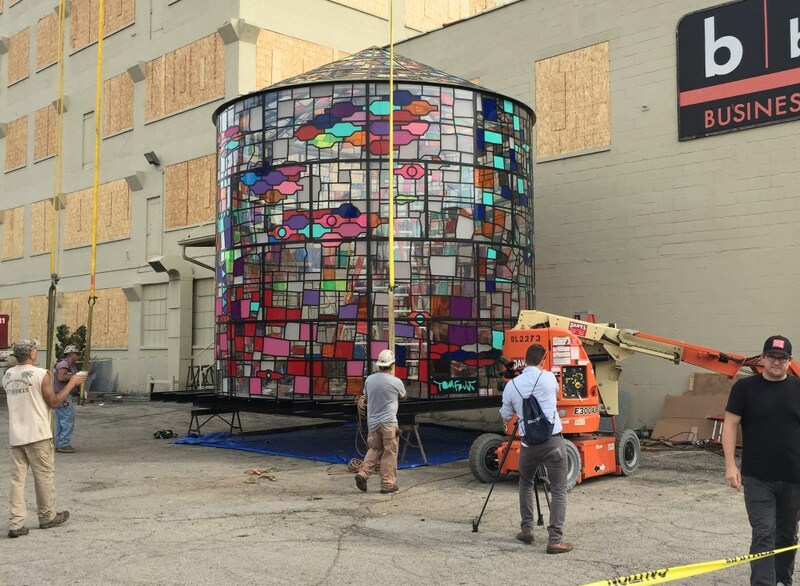 At ground level artist Tom Fruin’s water tower is not much to look at. Hovering above the Coakely Building at 400 S. Second Street in Walker’s Point is another matter. Makes one wonder whether public art works better farther away from the public. 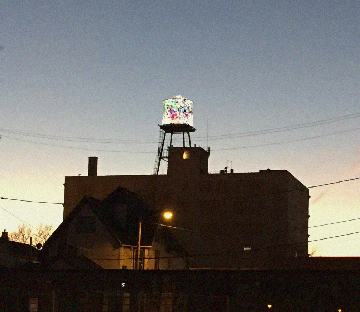 High art, like the flame on top of the old Gas Company building, is a lively touch. It glows like a fruit tart in a pastry shop. Cheerful, like cotton candy before you eat it. One need not probe for deeper meaning. If nothing else, this water tower is a relief from the profundities embalmed in the civic sponsored public art in Milwaukee. The Water Tower is beside the point and without any redeeming social value. We shouldn’t underestimate the value of irrelevant art. Speckled colored light on top of the building is a lot of fun. It glows in the dark and gets better at a distance. Yes. It’s fun like the yellow minion sculpture on top of a building a couple blocks over too. I’d certainly invite a couple more eclectic works to the mke skyline.